In a recent piece, CNN described the nascent Milk Party - a bipartisan Florida movement aimed at bringing (often ignored) children's issues to national attention. Chief among their areas of concern is the poor quality of American education. 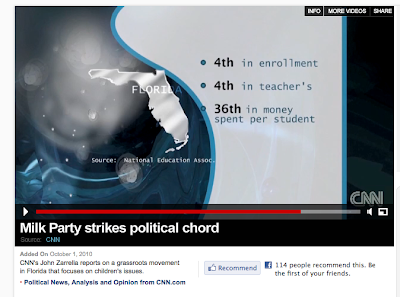 While deploring the poor state of our national education standards, CNN showed its own (poor) standards with a gloriously flagrant typo. Two lessons here: First, irony can be beautiful. And second, the Milk Party is definitely on to something.